Have you ever noticed that? No matter how much or how often you expose the horse to knitting and fiber it just shows no interest in it? Now there are always excuses - I have 4 feet and no hands - the yarn would get really dirty in the stable - I don't have opposable thumbs . . . . But I truly believe if the horse really wanted to knit he would figure it out. This is the case with my oldest daughter - who - you guessed it - is a big time equestrian. 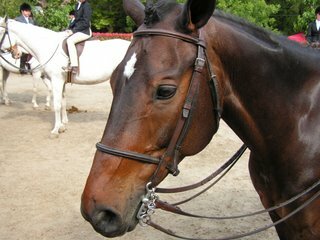 This photo is of Snickers, the horse she rode in last weekend's show. Well anyway - despite my continuing efforts I can not seem to interest her in knitting. I know that she CAN knit - I've seen the evidence. I know that she has opposable thumbs - I've seen those too. Yet somehow knitting holds no interest for her. I even took her yarn shopping. She spent lots of time in the store, picked out some wonderful Cascade 220 and fun yarn to make an Oregon Tote, I paid for all of it but alas - almost a year later it is still sitting here. Worse yet - the first skein and some nice size 11 circular bamboo knitting needles which started the project have gone missing! Maybe they are at the stables. Maybe Snickers is knitting when we're not there. 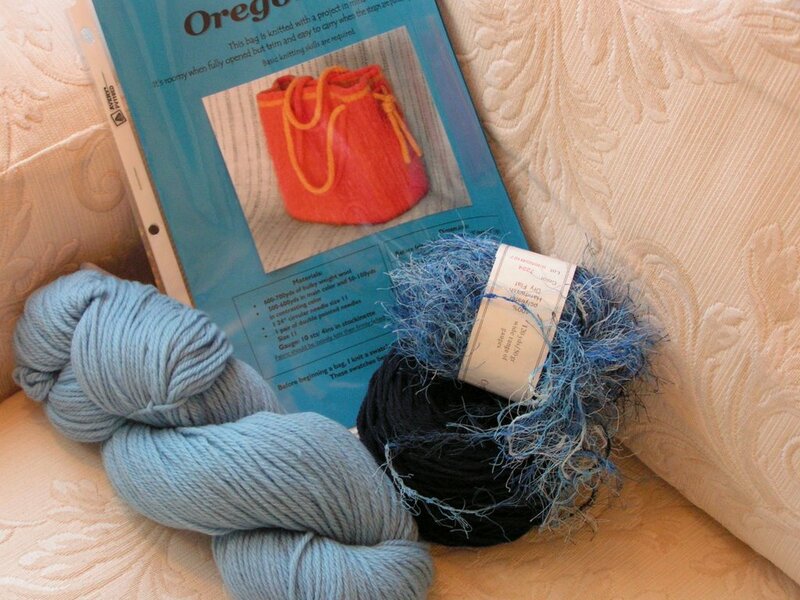 Now my Mom who is usually the most selfless person in the world is in love with this yarn. She loves the colors and keeps asking when I'm going to admit that Horsey Girl is never going to use it and let Mom have it. The other day I said, "maybe that's a good idea, I'll give it to you and you can make the bag for her." My Mom looked at me and smiled and said - that's not quite what I had in mind! Mom also has opposable thumbs - maybe I should give it to her! Alas, why can't everyone just think like us? I found that once I picked up my first set of needles and began creating stitches, I couldn't stop. As of yesterday, I crossed over into the realm of socks. I must admit they are quite addicting to knit, as I have done little else today. Can you believe one of my daughter's was very into horses for several years, too? Yet another thing we have in common. I made her choose between horses and gymnastics - not enough time or money to do both! - and she picked gymnastics.